I want to tell you a story. A story about a story. Several years ago, I was staying in B&B in Provence when I suddenly realized the engaging hostess I'd been happily chatting to for the past two days was the widow of Pierre Salinger, the well-known politician, journalist, and one-time White House Press Secretary to former U.S. President John F. Kennedy. I'd been vaguely aware of the connection before I checked in, but then work and photo shoots took over and I forgot, until I walked into the library one night holding a small aperitif that she'd kindly offered and noticed the photos of John and Jackie Kennedy. It was then that she began telling me a story. About Pierre. And JFK. And what happened the night that Kennedy was assassinated. As the story unfolded, my overworked brain cleared and I began to realize the significance of what was being discussed. And who my hostess was. And so I listened. I listened for the hour that it took to tell (by which time I had pins and needles and needed to wee! ), and as I did so, I realized it was an extraordinary story; the kind of story you hear perhaps three or four times in your life. I was immediately captivated but I was also conscious that it was the kind of story that needed to be saved somehow, so it could be retold to future generations. Of course some stories are not for retelling. And perhaps this was one. But, like most journalists and authors, I am of the firm belief that if we don't save such stories, if we don't archive them somehow, they will be forgotten. And then all these great stories that we hear in distant libraries will be lost in the dust of the footsteps of Old Man Time. I vowed then that if I was ever fortunate enough to hear another such story, I would write it down. As a journalist, I hear stories all the time. We all do. Stories that make us chuckle or laugh, or cry, and wipe our eyes, and cry again. I've even heard stories that were so astonishing, so far outside the boundaries of my beliefs, that I could only shake my head in disbelief. But those are the best stories, I think; the unbelievable ones. Because those are the ones that challenge us, and make us think. Those are the stories that force us to contemplate them, long after the last unbelievable word has been said. I have been working on one such story for the past five years. 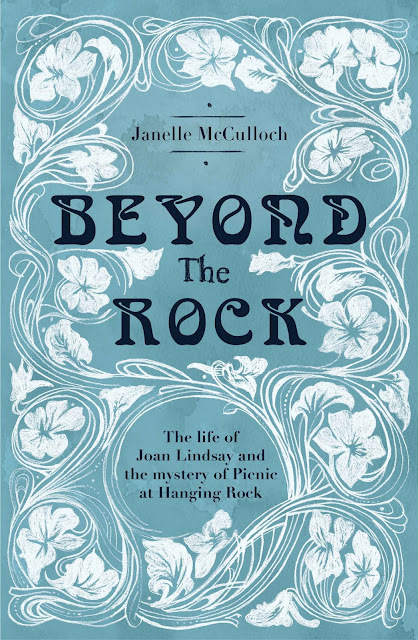 It's the story behind the story of Picnic at Hanging Rock, that beautiful, quietly haunting novel, which Peter Weir turned into an equally beautiful, equally haunting film. And after five years of research and long nights of writing, it is finally being published by Bonnier Publishers this weekend, on April 2, beginning with a two-chapter extract in the Good Weekend magazine in The Age and the Sydney Morning Herald. It's such an extraordinary story that I think it might even surpass the JFK story in the Intrigue Stakes. We are taught that things only exist if they are measurable. If they are not measurable, or quantifiable, we're not sure how to categorize them. But in researching this book, I learned that there is far more to life than what we blithely assume. The story of Picnic at Hanging Rock lies somewhere between the rational and the inexplicable, between reason and wonder, and the story behind it lies somewhere in that strange realm too. But it doesn't matter what I believe, or disbelieve -- or indeed what others believe, or disbelieve. 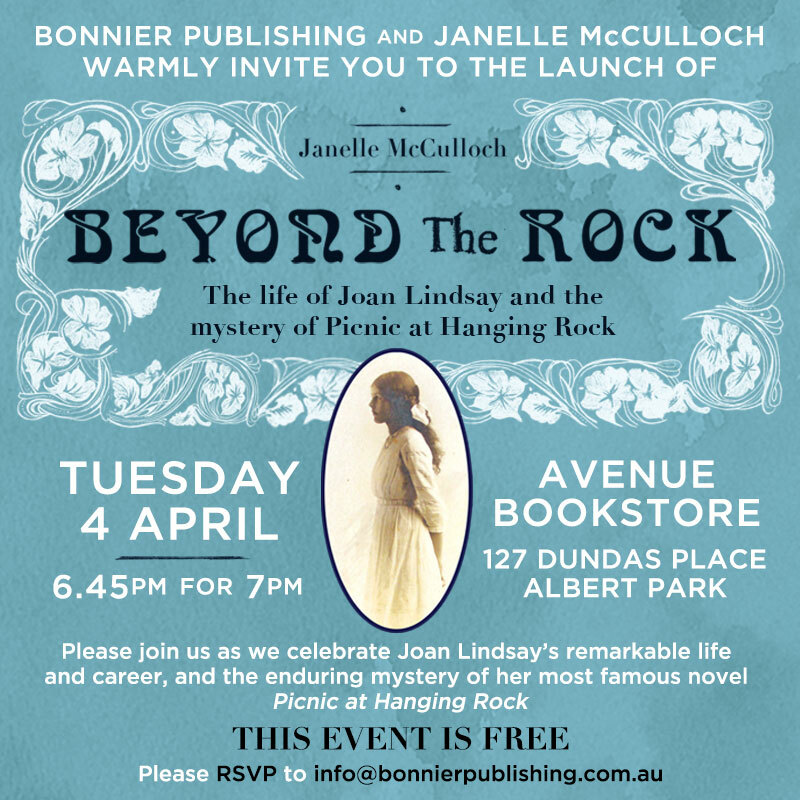 Picnic at Hanging Rock remains a great story, 50 years after it was first published. And I hope the story that I've written, the biography of its enigmatic, beautiful, complex, clever author Joan Lindsay, is just as enthralling. I also hope that others will write or record similar stories they hear. Because we need these stories, more than ever before. They are part of our history, and our identity, but more than that, they are places of grace; small sanctuaries amid the shoutiness and sound bites and Snapchat grabs of modern society. So I hope you'll all record your own life stories one day. And your family's stories. And those stories you hear in a library, in a landscape far away. And I can't recommend this adventure enough. 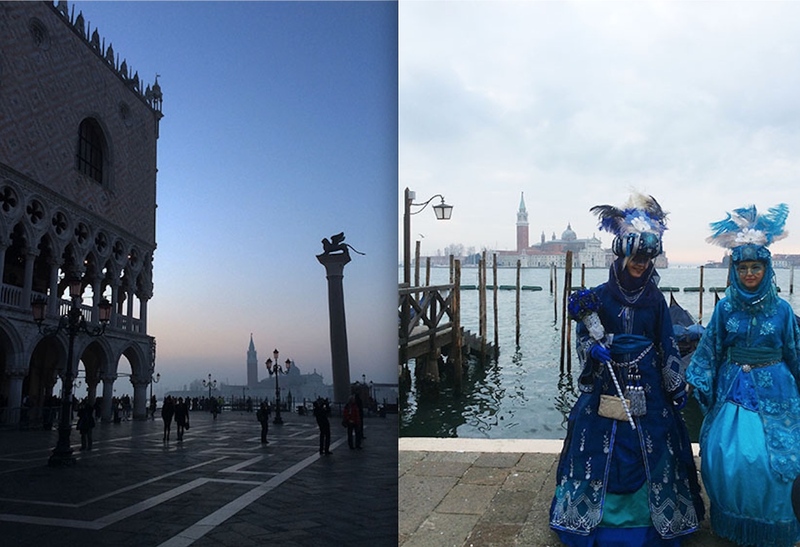 If you've never been to Venice, go in February. The costumes, wigs, hats, whimsy, watery backdrop, lagoon sunrises, and languid boat trips up the Grand Canal at the end of each foggy afternoon will lift your spirits faster than a fine prosecco. It is a city like no other. 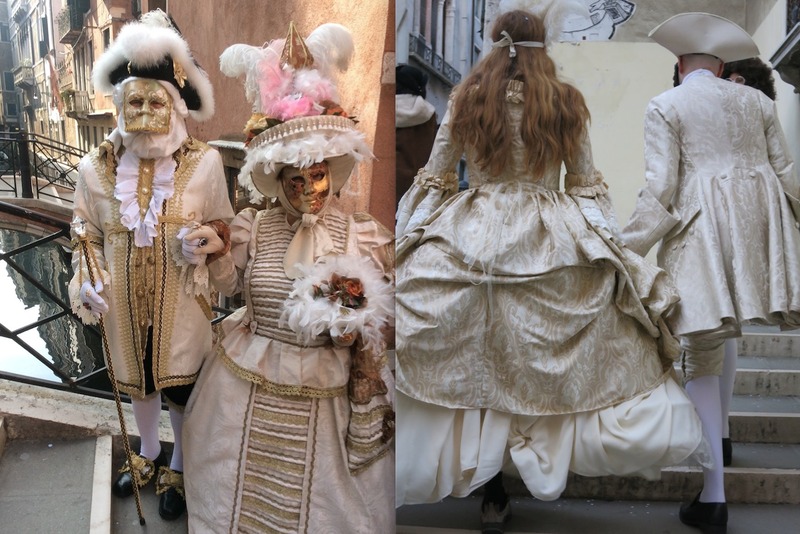 And during Carnevale, it becomes a magnificent mise-en-scène that is unparalleled anywhere in the world. 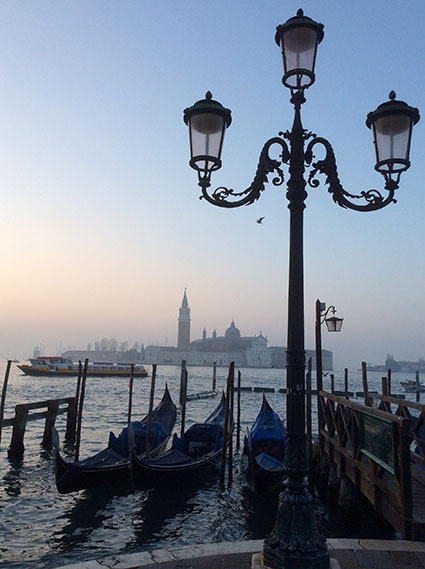 But if you're considering going to Venice, the best thing to do is not to plan too much. Just book a pretty boutique hotel, and there are plenty available to choose from. (I stayed at AD Place near Piazza San Marco, which has a wonderful Fortuny-like entrance of fabrics, exquisitely pretty striped rooms, and fantastic free breakfasts.) Then grab a map, tuck it in your pocket, and prepare to get lost amongst the grey-blue canals, because that's the best way to experience Venice. 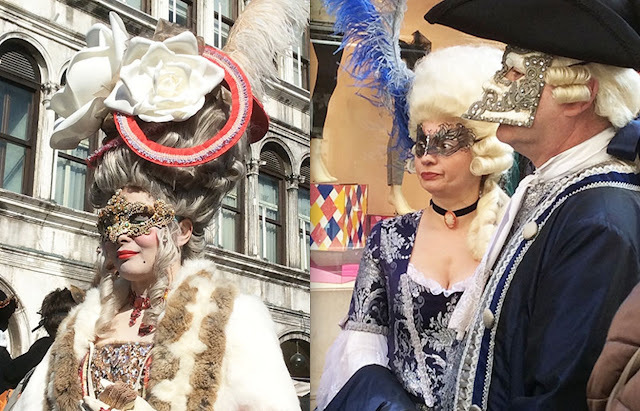 See the Fortuny Museum (beautiful, but read AS Byatt's book on Fortuny before you do), have dinner at the Aman Hotel (extraordinary interiors), or just buy a mask and join the crowds with their feathers and fun. 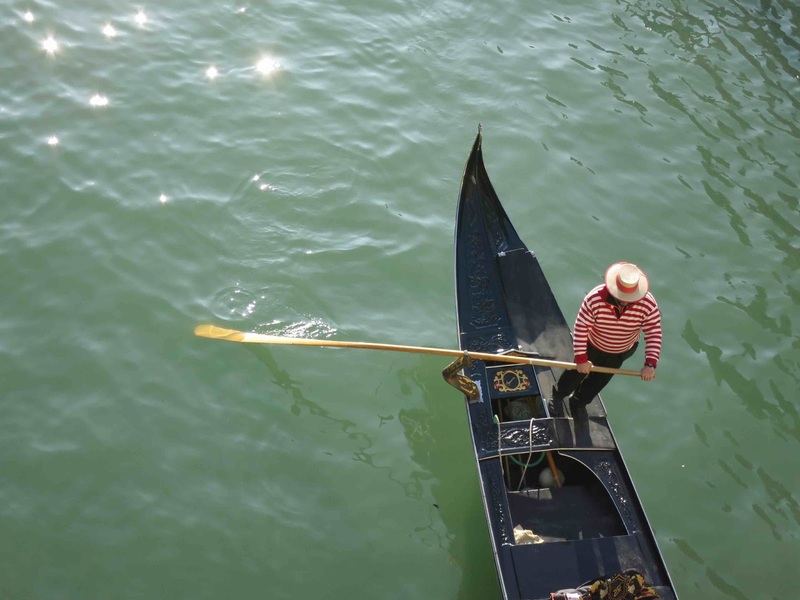 On the Saturday afternoon, having watched the judging of the elaborate costumes in the piazza, I grabbed a Bellini (Venice's famous drink) and sat in the sun in front of the Giardini Reali garden, watching the gondoliers and boats come and go. Dozens of others were doing the same. I'm certain we will all remember that moment, sitting on the steps in the winter sun as the Venetian watercraft went by. 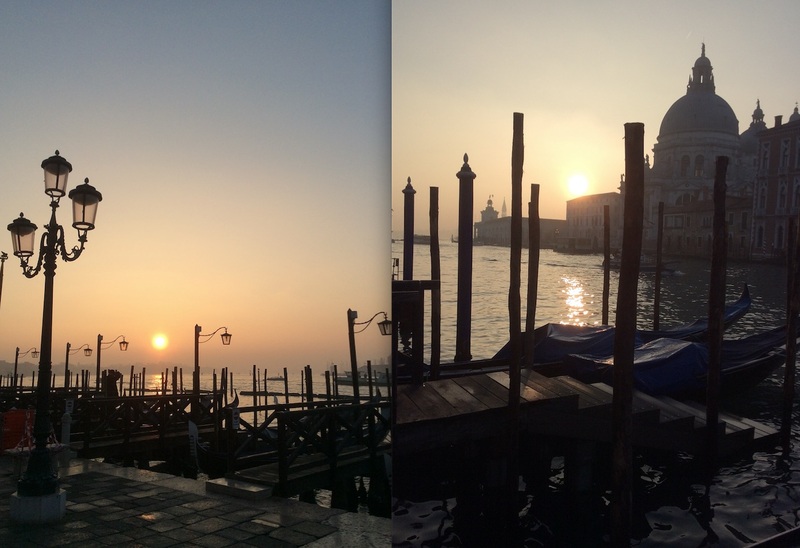 Venice offered the kind of simple bliss that many of us long for in our lives. All is took was a Bellini and a view to make the heart sing. That's what the best adventures are made of, I think. Simple things. 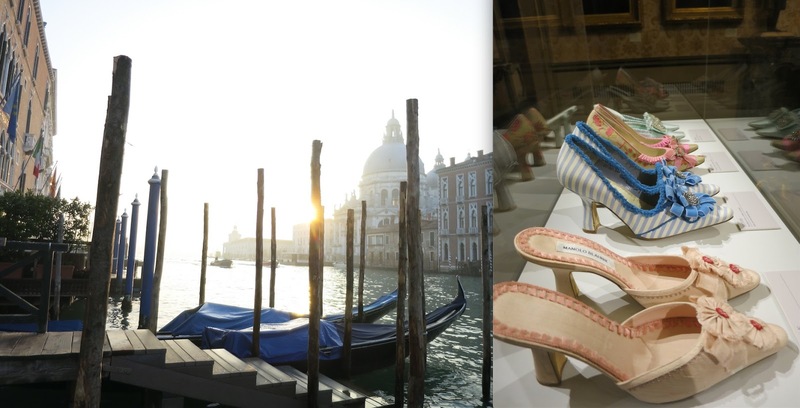 In Milan that same week, I finished a meeting early so I decided to slip in another adventure -- this time of the embroidered variety: the magnificent Manolo Blahnik Exhibition, 'The Art of Shoes', at the quietly grand Palazzo Morando. One of the best fashion retrospectives I've ever seen, this free exhibition (until April 9) spans almost 50 years of Mr Blahnik's collections and inspirations -- including his own grand adventures. Geographical influences are evident in many of his shoes (his love of Greece, antiquities and architecture certainly shows), but the 'Nature' room is perhaps the most beautiful part of the exhibition. Shoes designed with floral flowers, ivy, leaves, and other embroidered botanical motifs form a kind of romantic greenhouse. Even Manolo Blahnik confesses that he has a soft spot for his garden-inspired designs, particularly 'Ivy', the shoe that he created in 1972 for English fashion designer Ossie Clark. If you can't make it to Milan, there's a beautiful book to accompany the exhibition, The Art of Shoes, published by Rizzoli. PALAZZO MORANDO, MILAN. UNTIL APRIL 9. In London, I was lucky enough to catch another stunning exhibition, Vanessa Bell: 1879-1941, which chronicles the remarkable life and career of Vanessa Bell, who is finally achieving her own fame away from her sister Virginia Woolf and the rest of the outrageously talented Bloomsbury Set. The exhibition, at the Dulwich Gallery, isn't large, but is imbued with glorious, Bloomsbury-esque beauty, most notably in the paintings, portraits, letters, still lives, landscapes, notes, drawings, and photos of Charleston and the characters who lived, loved, gardened, painted, fought and loved again in the bucolic charm of the now-famous farmhouse. 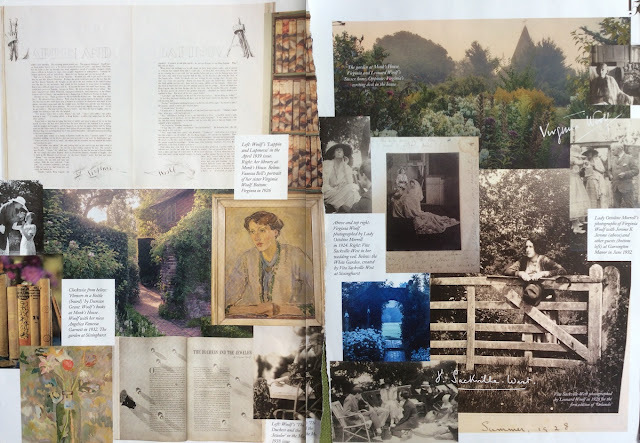 There's a great Guardian article called Design and Desires: How Vanessa Bell Put The Bloom in Bloomsbury here -- LINK. And there are several good biographies about Bell, the best of which is Frances Spalding's fantastic book. Or look for a copy of the March issue of UK Harper's Bazaar, which has several articles about the exhibition and also Charleston. (They might now be online). The most touching tribute in Harper's was an article by Bell's granddaughter, Virginia Nicholson, who praises her grandmother's "adventurousness". Vanessa Bell, you certainly were a quiet achiever. One of the things I've learned after being in publishing and books for so long is how far a gracious attitude will take you. Gratitude and thank-you emails are also important, of course -- in any career -- but being kind is imperative.I always try and practice kindness, even when situations are difficult, or relationships become strained, or illness / fatigue or other wearying factors test the patience. But I'm far from perfect. And I often fall down under the pressure of stress. But I always get up from the floor, apologise, and keep trying. Because graciousness and kindness are more important than ever. They're the only things that will get us through this turbulent year, I think. Bestselling author and photographer Robyn Lea is an example of real kindness -- and how it can take you far in life. 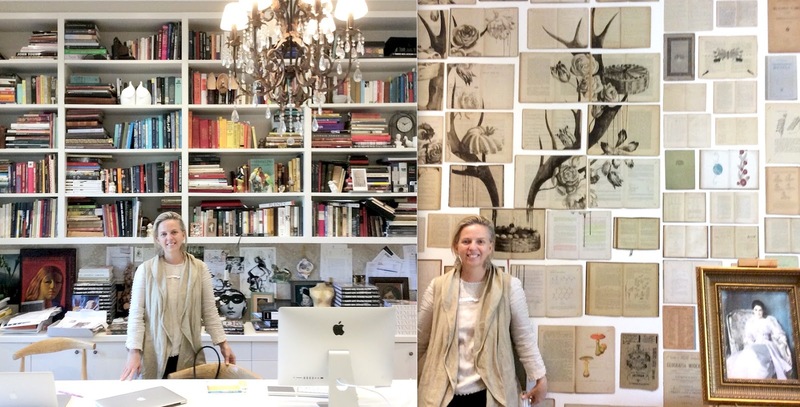 Formerly based in Milan and New York, Robyn now travels between Australia and the rest of the world for her work, and her photography schedule makes me dizzy! She is working on 10 (I think? It could be more?) books at the moment, including several Assouline titles. She is the epitome of an adventurous spirit. This is her library and work space. Gorgeous, non? But when I popped in to see her recently, what impressed me even more than her adventurous spirit was her generosity. She put me onto a contact of hers who is scouting for new stories for SBS, which then springboarded into a meeting next week. Even if it doesn't amount to anything, I was deeply touched by the gesture. 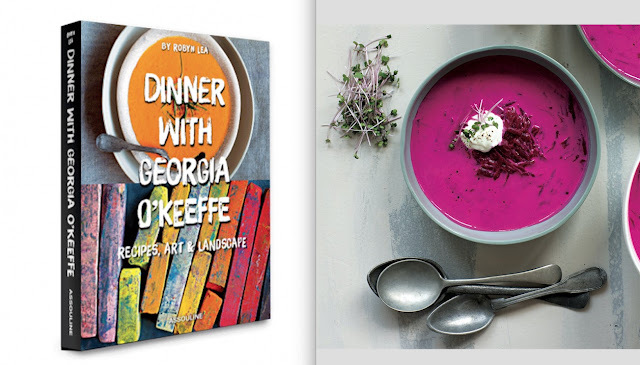 This is her beautiful new book, Dinner With Georgia O'Keefe. It's out now (Assouline), and is a follow-up to the New York Times bestseller Dinner with Jackson Pollack. Both titles are filled with beautiful photos and delicious recipes, and would make gorgeous gifts!